Carve your pumpkin the way you always do. Be sure to get out all the yucky stringy things. 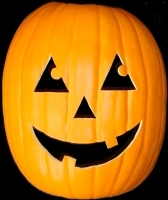 Empty the entire package of Pumpkin Embalmer ® into a 5 gallon bucket and add 3 gallons of warm water. Note: When stirred or aggitated, the solution will turn milky-white in color. 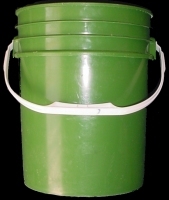 The inert white particles will eventually settle to the bottom of the container, leaving the active portion of the solution clear. 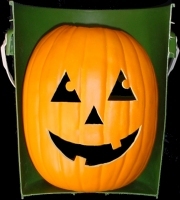 Place the lid of your Jack o'Lantern inside the hollow pumpkin, and put the whole thing in the bucket. For best results, hold down the pumpkin with an old brick tied to a string, or you can even use a 2 Liter soda bottle filled with sand. Let it soak overnight, or up to 24 hours, then remove your Jack O'Lantern and dry it off. If any Pumpkin Embalmer ® residue remains, you can wipe it off with a dry paper towel. Use the same batch of Pumpkin Embalmer ® over and over again to soak as many Jack o'Lanterns as you want!